Michael Chorost has given over 170 lectures since 2005 to audiences such as Google, IBM, Procter & Gamble, Brown University, Duke University, and the National Institutes of Health. His intimate knowledge of technology and philosophy makes him an ideal speaker for addressing the biggest questions about how technology will change education, relationships, consumer society, and play in the coming decades. He discusses profound questions that are often asked in today’s technological age: What are computers doing to our bodies, our friendships, and our working lives? How do we live whole and full lives in a world saturated with technology? Two talks that Dr. Chorost frequently gives are “Cyborg Theory and Practice,” in which he talks about how science-fiction fantasies of the cyborg compare to the medical realities of the early 21st century, and “How to Put Your Brain on the Internet,” in which he uses cochlear implants as a launching point for exploring how new technologies are laying bare the mechanisms of human cognition. He shows how it is becoming conceptually possible to enable one brain to communicate directly with another. Here’s a captioned version of it on YouTube. How will future technologies change the body? Implants and prosthetics are already changing the lives of people with disabilities; will they ever be useful for people without disabilities? Is electronic communication alienating people from each other? 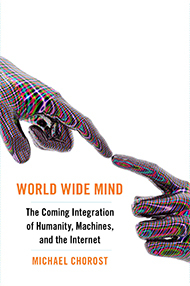 How can people relate to each other more richly and productively in a technological age? How do prosthetics and implants such as cochlear implants actually work? How are they integrated with the body? How do users adapt to such radical changes in the human sensorium? What new technologies make it conceptually thinkable – not yet practicable, but thinkable – to create technologies that can know what a brain is perceiving, remembering, and feeling? What philosophical and ethical frameworks are the most useful for thinking creatively about how society is changing in the 21st century? Dr. Chorost’s superb speaking skills have been honed by 15 years of teaching at Duke, the University of Texas at Austin, and the University of San Francisco. Students have often rated him as being the best teacher of their undergraduate career. His speaking style is thoughtful, engaging, and wryly funny. Despite his total deafness, his cochlear implants let him use the phone easily and take questions from audiences with skill and flair. To see a list of his upcoming and past lectures, click here.